Wow! It's been a while since my last post! Like everyone else, the Christmas season just sweeps me away with all it's splendor, and insane busyness! I also have several birthday people in November and December, so before I know it, it's the new year. I have been wanting to do a few posts on winter weddings for a while, as just recently I have been quite overwhelmingly fascinated by them, and I told Josh the other day "um...when we get married, we may have to do a summer and winter wedding, there is no way I can choose between the two!". There are so many elements of a winter wedding that appeal to me. First of all, it's the "holiday" season. Being the Christmas freak that I am, I am not sure as to why I never considered a winter wedding. They are warm, cozy and extra romantic. Being with those you love the most is so important during this time of year. Now, that's the emotional side of the weddings that I love. 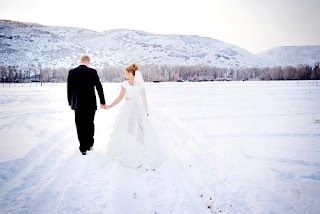 The practicality of a winter wedding is also very appealing. The winter season is not as busy as the summer for weddings, therefore, the fight for the venue of your dreams may not exist, as well, as the price tag may be slightly lower. Also, if you are like me, and have a lot of family that is out of town, to have them come in for the holidays is nice, to spend time with family other than just the wedding is an added bonus. I have come across several Winter wedding themes that I love, so I will do a tri-posting on the blog this cold January evening, Rustic Winter Romance, Red Velvet Christmas and A Snowflake Ball. Enjoy!